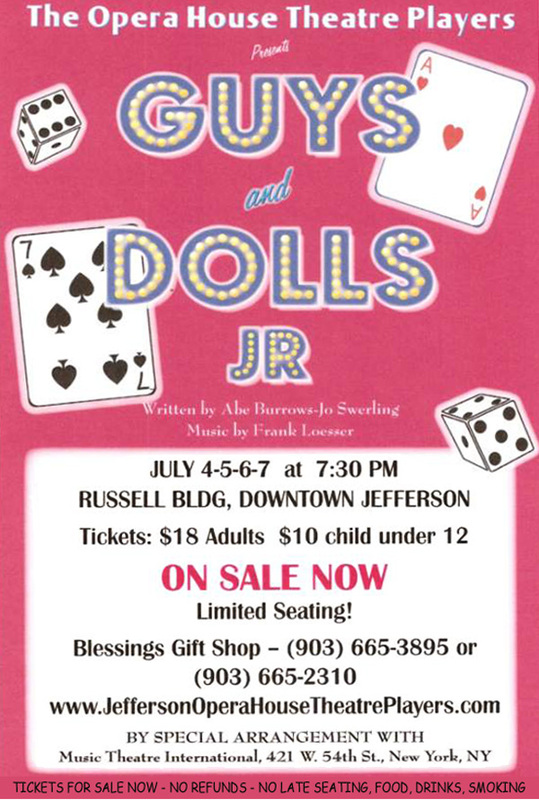 The Opera House Theatre Players presents “Guys and Dolls Jr” on July 4, 5, 6, & 7 at 7:30 p.m. in the Russell Building on Austin St in downtown Jefferson. Tickets are $18 for Adults and $10 child under 12. Seating is limited so buy your tickets early from the Blessings Gift Shop 903-665-3895 or 903-665-2310. If you are still looking for lodging for your vacation to Jefferson TX; we still have some vacancies. Pick your room today. 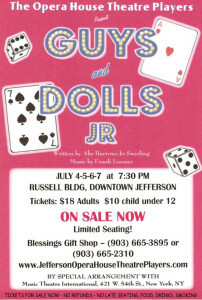 This entry was posted in Summer Events, Theater by Tammy D. Bookmark the permalink.